The jaw liner (toothed plate) of the jaw crusher, the moving liner (toothed plate), and the two sides of the liner (guard) are the simplest to wear. After severe wear, the grain size of the product is increased. In the early stage of wear, the tooth plate can be turned around, or the upper and lower parts can be used. The wear of the seesaw is mostly in the middle and lower parts. When the tooth height is worn off by 3/5, it is required to replace the new liner. When the two linings wear out 2/5, they also need to be replaced with new ones. If there is little wear on the shaft, it can be turned on the lathe to make the journal reach an exact number of shapes, and then reduce the inner diameter of the bearing accordingly. However, after several such treatments, if the journal size is reduced by 5% compared to the original, no turning is allowed, and the new shaft should be replaced. The jaw crusher is operated under the impact load, the Babel alloy lining on the bearing shell, the operation period is about two years at the mercy, beyond the deadline, then the need to cast from scratch. 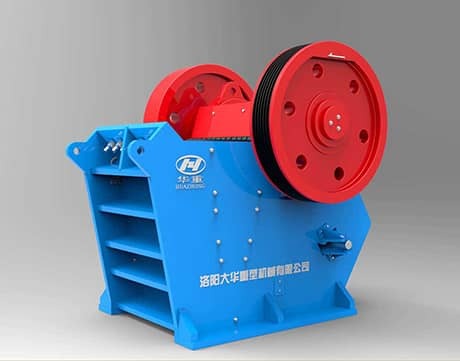 The most frequently replacement of the jaw crusher is to replace the thrust plate. Regarding the connecting rod is the whole crusher to remove the thrust plate, you must first unscrew the baffle screw, block the dry oil smooth tubing, hang the thrust plate on the crane lifting hook or other lifting equipment, and then you can loosen it. Open the spring at one end of the horizontal tie rod, and move the tamper to the fixed and take out the thrust plate. If the rear thrust plate is to be taken out, then the connecting rod should be swigged together with the front thrust plate and the moving jaw, and the rear thrust plate should be taken out. After the thrust plate is unloaded, stop the thin oil smooth pipe and cooling pipe, and support them under the connecting rod with a support, and then remove the cover of the connecting rod before lifting the connecting rod. The main shaft of the E-break should be removed together with the pulley and the flywheel when disassembling. During the disassembly process, move the motor (along with the belt) along the sliding rail as far as possible to the crusher, remove the V-belt, and then lift the shaft with the crane.